General To Lam, Minister of Public Security attended and addressed the conference. The event also saw the participation of leaders of agencies and units under the Ministry of Public Security and nearly 200 excellent young public security officers, representing the whole force's youth. Minister To Lam and delegates at the event. 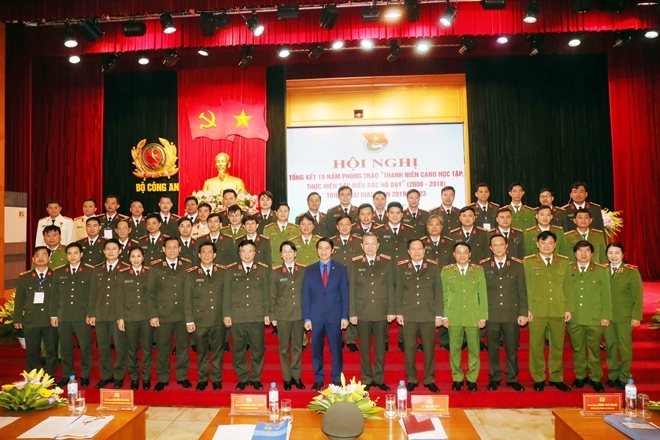 During the conference, Major Colonel Dong Duc Vu, Secretary of the Ministry of Public Security's Youth Union said, over the last 10 years, the movement of "Public security youths following Uncle Ho's 6 teachings" has played a major role in encouraging and mobilizing young public security officers to be more active and creative at work, contributing to achieving the general glorious victories of the Public Security Forces. The movement has also helped public security youths improve their political will, bravery, morals, knowledge and professional competence, and promote their sense of discipline and working responsibility. In fact, young public security officers have also reaped remarkable achievements in ensuring public order, safety and national security; in doing scientific research; and in carrying out social activities. During the conference, young delegates, representing thousands of young Public Security officers, contributed good ideas to renovating the contents and forms of youth movements, and shared interesting experiences of the implementation of youth movements. They also discussed measures to better perform the youth's missions in the coming time. Addressing the event, on behalf of the Public Security Central Party Committee and the Ministry of Public Security's leadership, Minister To Lam praised the large achievements of the public security youth in implementing the movement of "Public security youths following Uncle Ho's 6 teachings". General To Lam emphasized that young public security officers have always been proactive and creative in performing their duties over the past time, while also taking the lead in organizing and implementing movements in a practical and efficient manner, in line with resolutions of the Public Security Central Party Committee. 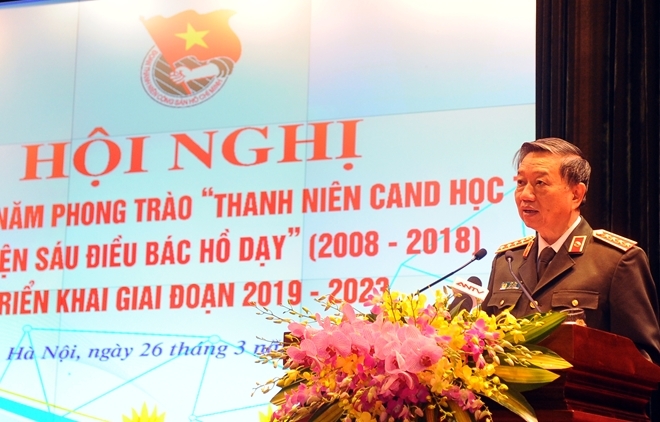 The Minister of Public Security highlighted some major achievements of the public security youth in implementing the movement of "Public security youths following Uncle Ho's 6 teachings", saying that the public security youth has deserved to the title "Public security officers wholeheartedly devoted to the country and the people" while also beautifying the image of the Vietnamese youth in Ho Chi Minh's era. In his important remarks at the meeting, the Minister of Public Security also urged all young public security officers to seriously overcome their limitations in implementing the movement in the future.